It’s hard to believe that it’s been three years since I opened the first Francis Ford Coppola Cabernet Sauvignon for my inaugural wine review. 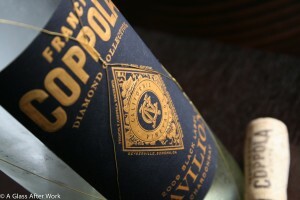 Since then, I’ve celebrated each anniversary by opening a bottle of wine from the Francis Ford Coppola Winery. The first year, I revisited the 2006 Diamond Collection Cabernet, and the second year, the wine ladies and I watched the Oscars and opened the 2008 Director’s Collection Pinot Noir. This year, for A Glass After Work’s 3rd Blogiversary, I hopped off a plane from a girl’s weekend in Vegas and opened a Chardonnay to enjoy while telling Hubby about the weekend’s adventures. The 2009 Francis Ford Coppola Diamond Collection Black Label Pavilion (winery) was blend of 96% Chardonnay and 4% Viognier grapes and had a medium lemon yellow color. On the nose, there were grapefruits and limes mixed with a touch of vanilla, ginger, and apricots. In the mouth, there were apricots and ginger with hints of pears, passion fruit, grapefruits, and vanilla. The wine had a medium-to-full body with medium acidity. Is this worth a glass after work? Definitely! If you see this wine in the store, grab it; you won’t be disappointed. At an SRP of $17, this Chardonnay was a silky, smooth way to celebrate A Glass After Work’s 3rd birthday. I was sorry I didn’t have any food to pair with it, as I think it would be a great food wine. However, it did a wonderful job brushing off the travel dust as Hubby and I spent an hour talking before calling it a night. It was refreshing wine, even with the lower acidity, which helped keep it from being “biting.” That, combined with the creaminess, allowed me to sink into the wine and the conversation. This was the first time I tried a white from the winery, but it certainly won’t be the last. Question of the Day: Are you a blogger? How do you celebrate your blog’s birthday? I’ve wanted to try that wine for awhile now. …and the wine is a pretty easy one to find. I definitely recommend grabbing a bottle, particularly since it’s budget AND food friendly.